On Friday January 19, the Woman’s Club of Parsippany Troy Hills (WCPTH) held its Third Annual Spelling Bee. 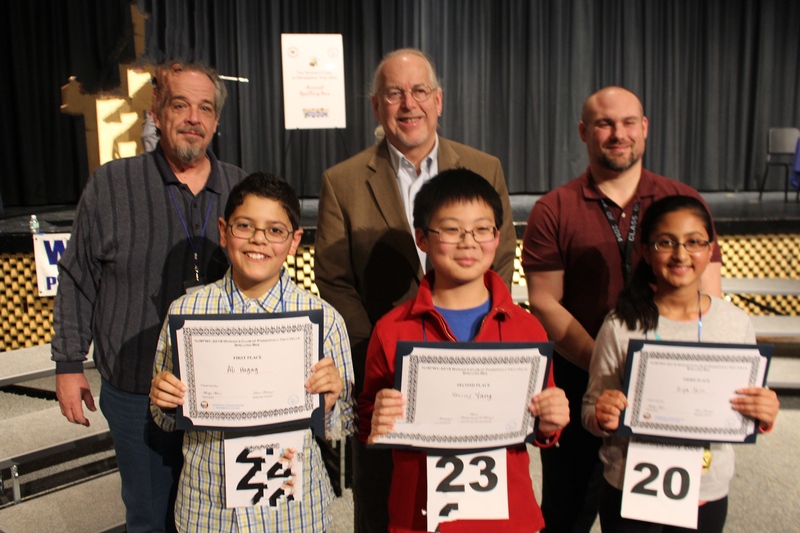 Twenty-four students were selected from area Fifth Grade Elementary Schools to participate in the Spelling Bee, which was held at Parsippany Hills High School (PHHS). Over 125 parents and family members watched the students. Judging the event were; Greg Elbin, retired teacher and Past President of Kiwanis Parsippany, Michael DiSanto, Principal of PHHS, and William Westhoven, reporter at Gannett NJ Daily Record. Diana Freidinger, WCPTH club member and chairman of the Third Annual Spelling Bee, was the Moderator and club member Marianne Burke was the Pronouncer. After 25 exciting rounds the 1st Place winner was Ali Hagag from Knollwood Elementary School. 2nd Place winner was Sunny Tang from Intervale Elementary School and Riya Jain from Littleton Elementary School was 3rd place winner. The winners are invited to participate in the New Jersey State Federated Women’s Club (NJSFWC) Regional Spelling Bee on Saturday, February 3rd in Rockaway. The Regional winners will then be invited to the State Championship at the New Jersey State Federation of Women’s Clubs of GFWC (NJSFWC) Headquarters on Saturday, March 3rd in New Brunswick.